Teamwork is the common threat that all sports and businesses need to succeed. The greatest asset in any company is their people. It is the investment into the building and continued development of those people that make teams and companies flourish. These facts are often forgotten in exchange for quotas, budgets, or simply the bottom line. 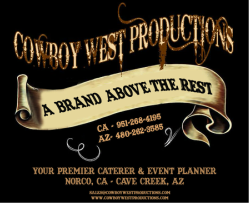 That's why Cowboy West Productions specializes in opening the doors of communication, taking down obstacles and developing your best asset called "people." CWP helps people out of their comfort zone by challenging, motivating, and educating them through interactive activities, lessons, and the good old fashioned "Code of the West."